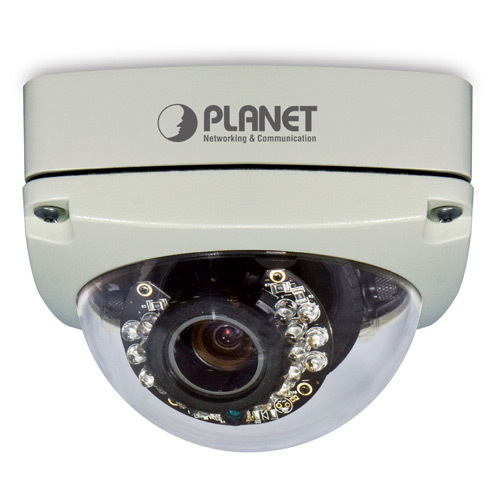 PLANET has announced the new ICA-HM136 H.264 2 mega-pixel outdoor infrared vandalproof Internet, which meets the next generation demands in the world market. The ICA_HM136 can simultaneously provide H.264, MPEG-4 and M-JPEG video streaming in small video size; therefore, it saves you lots of bandwidth usage. Through high performance 2 mega-pixel CMOS sensor, the ICA-HM136 delivers high quality image at maximum 1600×1200(UXGA) resolutions for color images. It is also equipped with 2.7mm to 9mm vari-focal auto iris lens allowing easy installation and camera angle adjustment for different installation sites. With built-in 18 IR LED around the lens and the IR-cut filter, the ICA-HM136 can provide good video quality in both day and night surveillance up to 15 meters. The network and analog video output interfaces are also provided in the ICA-HM136 for flexible viewing and recording implementations. The ICA-HM136 complies with IEEE 802.3af PoE interface for flexible and easy installation on the ceiling without concerning the outlet / socket locations and thus it further eliminates the need of power cables and installation costs. In addition, the ICA-HM136 supports 2-way audio that enables audio communication between local and remote ICA-HM136 installed sites by using the external microphone and adding an external speaker. 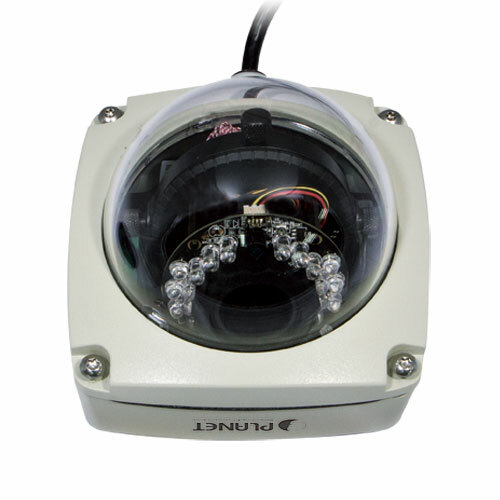 The ICA-HM136 is the perfect choice for outdoor surveillance system by providing IP-66 certified waterproof protection. It is designed with vandalproof and IP66 weatherproof case that can shield 400 pounds of impact. The vandalproof design with die-cast aluminum body prevents the intentional destruction. The water-resistant construction with weatherproof solid housing performs reliable operation in any environment. The ICA-HM136 can be managed by PLANET Cam Viewer 3, the professional IP surveillance management software that provides monitoring, recording and event management functions for multi-camera video surveillance applications. The Cam Viewer 3 enables you to set up a comprehensive and effective surveillance system quickly and easily to protect your property and life. PLANET ICA-HM136 provides various surveillance applications to deliver crisp and clear images, perfect for the identification of objects and persons. 2013-05-07 1.0.42_PL 1. Fix HttpNotify can’t fill in issue. 2. Add ONVIF 2.1 function. 3. Fix time of event trigger file incorrect issue. 2012-12-06 1.0.34_PL 1. Fix specific mail server can not send. 2. Fix auto deletion abnormal issue. 2012-03-12 1.0.32_PL 1. Add PLANET DDNS function. 2. Add log function of ddns. 4. Fixed the log send issue.